The Census asked people how many hours a week (including paid and unpaid overtime) they usually worked in their main job. Full-time is defined as 31 hours or more and part-time 30 hours or less. In 2011, the highest proportion of Surrey’s residents in employment worked full-time (72.7%), while the proportion for England as a whole was 70.9%. The borough with the highest percentage of people employed full-time was Spelthorne (75.1%) and the borough with the lowest was Waverley (70.2%). 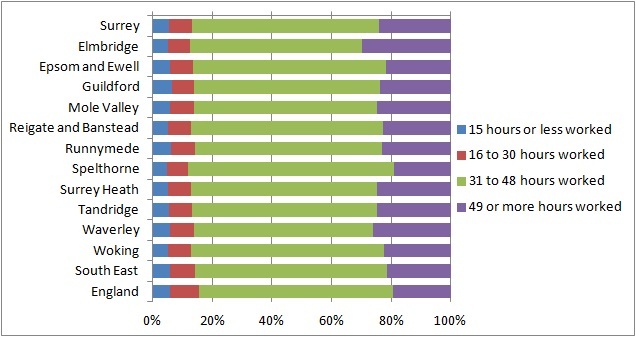 56% of the Surrey’s residents worked 31 to 48 hours and 16.7% worked 49 or more hours. 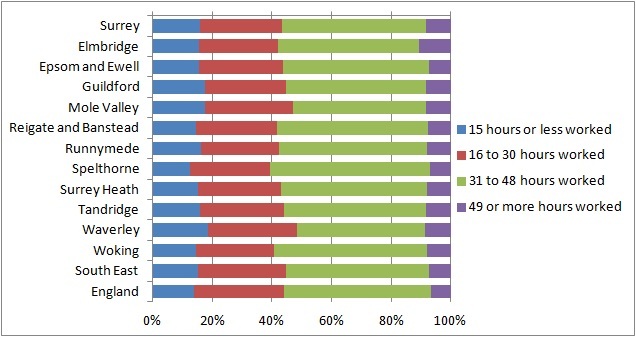 The borough with the highest proportion of people working 49 or more hours was Elmbridge (20.9%). 10.4% of the Surrey’s residents in employment worked 15 hours or less. The borough with the highest proportion of residents working 15 hours or less was Waverley (11.9%). In 2011, 56.6% of Surrey’s female residents in employment worked full-time and 43.4% worked part-time. The borough with the highest proportion of female working full-time was Spelthorne (60.6%) and with the highest proportion part-time was Waverley (48.3%). In 2011, 86.8% of Surrey’s male residents in employment worked full-time. The borough with the highest proportion of male working full-time was Spelthorne (87.9%) and with the highest proportion part-time was Runnymede (14.2%). Over 40% of the female residents in employment worked part-time, while the percentage of male was just over 10%. 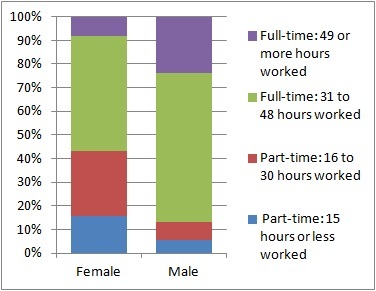 The proportion of female residents working 15 hours or less was almost 3 times higher than the proportion of males. On the contrary the proportion of females working 49 or more hours was 3 times lower.